A stylishly rustic concoction of canvas, stone and thatch with a funky Afro-Asian mix of vibrant colours, Jaci's is an attractive Madikwe option! We love how Jaci has let her creative juices flow with the lodge's new bright and funky colours that give the camp a real vibrancy! Gorgeous, romantic accommodation, with wonderful outdoor showers and massive mosaic baths that'll easily accommodate the 2 of you! The sociable fire-pit in the main lounge area is the perfect place to keep warm on a chilly evening whilst chatting with fellow guests over a warming drink! When the Madikwe project to convert this massive area of marginal farmland back into a pristine wildlife reserve began back in the early 1990's, husband and wife team Jan and Jaci van Heteren were some of the pioneers who saw its huge potential – after developing and then selling their interest in another lodge, they missed the reserve so much that they quickly decided to return and build the lodge of their dreams. The result which opened back in 2000 was Jaci's Safari Lodge which immediately drew attention for its inspired eclectic style and warm hospitality! We have to confess to having a personal connection here – Rosie and Derek, owners of Bushscapes, actually got married at Jaci's a few months after it opened, in a memorable 3 night “Bash in the Bush” that we and all of our guests absolutely loved and still talk about to this day! And more than a decade later Jaci's is still delighting guests looking for a stylishly different lodge experience in this superb reserve! Madikwe lies in Herman Charles Bosman country in the Groot Marico area near the Botswana border close to the Kalahari Desert. Its massive 75 000 hectares were restocked with game during Operation Phoenix, one of the largest wildlife translocation projects in the world which involved the capture and transport of some 8 000 animals (including the Big Five and the highly endangered wild dog) from other reserves to the park over a six year period! On the edge of the Marico river in the heart of the reserve is where you will find Jaci’s Safari Lodge. Reached by a stunning suspended walkway, Jaci's boasts eight luxurious rooms and two family suites, each with a large mosaic bath (big enough for two to share!) outdoor "bush" shower and private deck, from which to watch warthogs rolling in the mud or tree squirrels darting through the foliage! With thatch roofs, low stone walls and canvas panels that roll up, the spacious rooms really let the outside in - making for a unique African safari experience even from the comfort of your bed. All the suites are equipped with underfloor heating to ensure that you are comfortable during the chilly winter months, and air conditioning and a ceiling fan to keep you cool during those sweltering summer days. The thatched lodges are linked by sandy pathways and raised walkways that cut through the dense veld beneath chattering monkeys and flittering bird life! 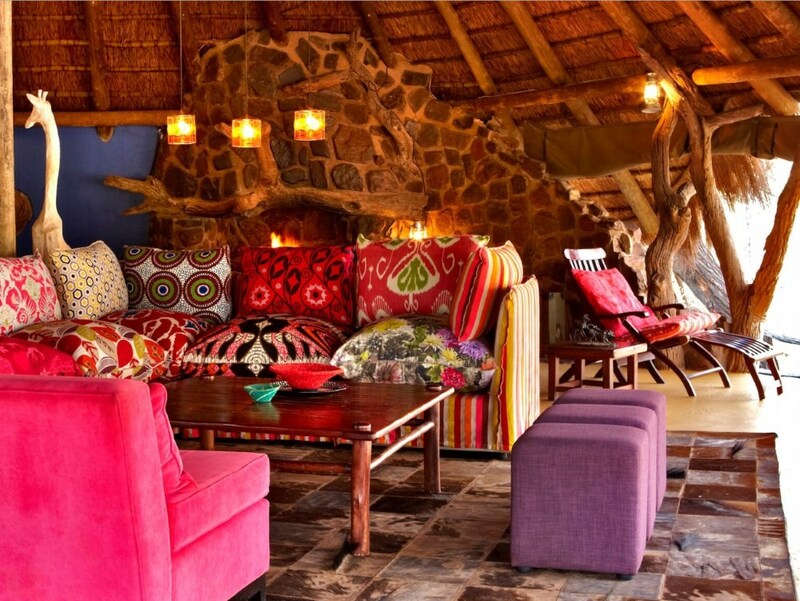 Jaci took charge of decorating the lodge and the result of her inspired creativity is a beguiling and funky Afro-Asian mix of vibrant colours, African textures and ethnic sculptures. All rooms are doubles but to enhance everybody’s bush experience, stretcher beds can be set up in your room for the little ones. For families that would like more space, the chic family suites (the Safari Suite sleeping 4 adults and 4 children, and the Nare Suite which accommodates 6) are a great option - the suites come with their own ranger and game drive vehicles, as well as a private plunge pool to cool off in. At night you can choose to dine with other guests (in the boma or around a pit fire) at the lodge or have your own private dinner! With Jan and Jaci being parents themselves who have raised their 3 kids in Madikwe, they made sure to make the lodge very child-friendly with such things as a games room for kids, a separate earlier kid's dinner time with dedicated menu (featuring favourites like spaghetti bolognaise and hamburgers) as well as child minders (at extra cost) so parents can enjoy some unhastled adult-time – they also offer family game drives so you can truly enjoy the bush together as a family without worrying about disturbing other guests. The main lounge at Jaci's is a wonderfully attractive and welcoming space perfect for relaxing with a good book or a cold drink – with views out and across a small stream, it's where brunch and high tea are served (or if you're in need of something a little stronger then head up the stairs to the loft bar!) For chilly evenings the main lounge has both a large fireplace where you can pull up a chair and warm yourself, as well as a stunning circular fire pit around which guests gather to enjoy good conversation over delicious mug of hot chocolate or a glass of good red. 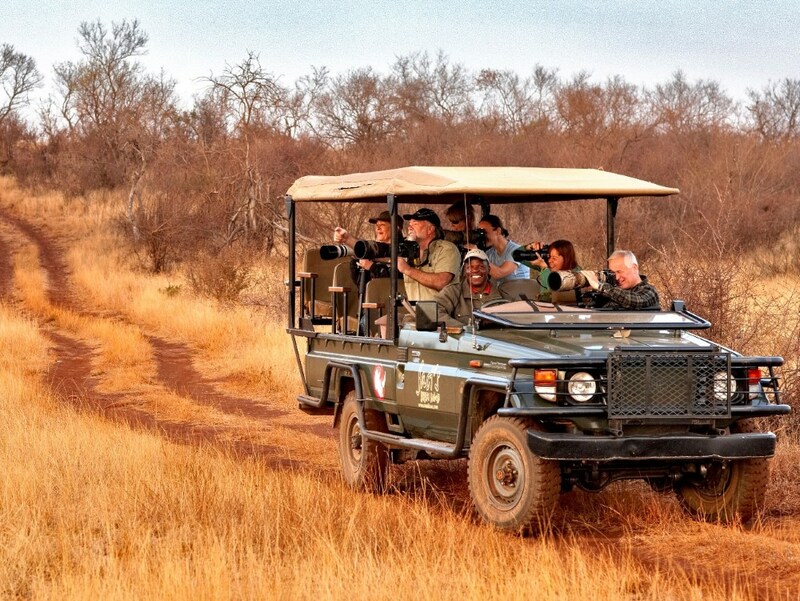 A fleet of rugged land cruisers – with tough 14-ply tyres and suitably elevated seating – offer premier game viewing along Madikwe’s main and off-road trails. 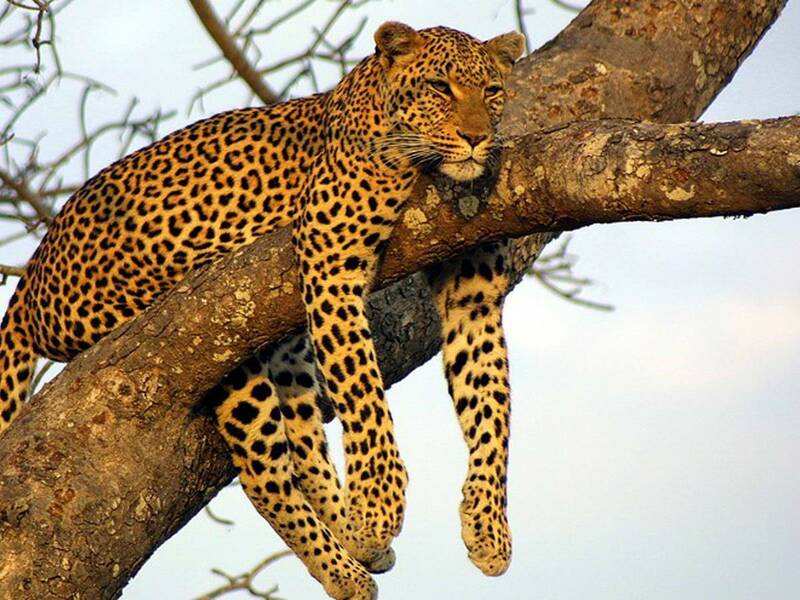 The game rangers here focus on the “Top Ten” rather than just the Big Five - so in addition to the well known lion, buffalo, leopard, elephant and rhino, families also have great chance of seeing hippo, giraffe, endangered wild dog, both brown and spotted hyena as well as cheetah! Jaci's guides use a two- way radio system to keep in touch and share prime sightings as you traverse the vast expanse of thorny and scrubby terrain in search of game! The rangers have a wonderful collection of interesting snippets of information on local customs, flora, geology, history and geography – all of which is guaranteed to make your African safari game drive fun and informative. Something else unique to Jaci's is its starbed – a four-poster bed perched on top of the 'hide' above a watering hole where you can enjoy an unforgettable sleep out in the wild and experience the sounds, smells and sights of the bush from your elevated vantage point! Back at the lodge you've got the choice of two swimming pools which you can laze about during the heat of the day, or if you're feeling a bit more lively you can enjoy a work-out in the lodge's gym. Our choice though is something way more pampering and relaxed – a soothing massage at the new Marsala Spa! A child sharing a room with a single Adult. The Adult will be charged a single rate and the child will pay the applicable child rate.